Produce delicious, high-quality barbecue at home with your barrel grill. The offset heat of a side firebox gives the barrel grill a perfect setup for low and slow cooking. 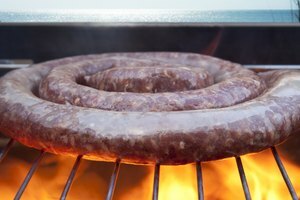 Buy a nice piece of pork and invite some friends for a tasty barbecue done to perfection inside your barrel grill. Line your firebox with slightly crumpled single sheets of newspaper and a single layer of charcoal briquettes. 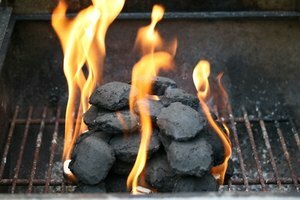 This will help to burn your coals quickly and evenly without the use of lighter fluid. Use matches to carefully light the fire in the firebox and allow it burn down to hot grayish-white coals. Blowing lightly will help remove unwanted paper ash and stoke the fire to be ready faster. Soak your hardwood chunks in water for an hour before placing them on the hot charcoal in the firebox. Wet wood will create a slow smolder and steady burn for more thick flavorful smoke. Pat your piece of pork dry with paper towels before massaging in liberal amounts of your dry spice rub. 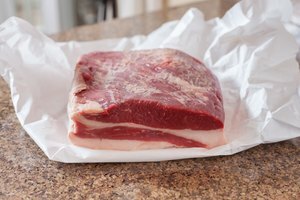 Doing this will promote adhesion and discourage large clumps of seasoning crust from forming on the meat's surface. 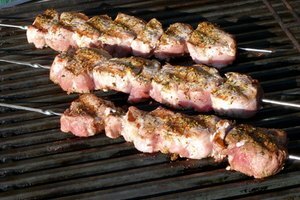 Place the pork in your barrel grill nearest the firebox for five minutes on each side. This fast hot cooking will produce a thin outer crust to hold in moisture. Move your meat away from the firebox for long-term offset barbecuing. This will allow the meat to come to temperature gradually while gaining smoky flavor. Adjust the vents on your barrel grill to keep the internal temperature running between 225 and 250 degrees during the barbecuing process. Remove your pork when you achieve an internal thermometer reading of 160 degrees. Allow the meat to rest for five minutes before slicing. Fruit-bearing trees are a favorite for hardwood smoking. Try different wood blends to find a perfect pairing for your choice of dry rub spices. Use a small paring knife to make incisions large enough for whole garlic cloves to be inserted in the meat's surface for an added flavor surprise. Always clean your firebox thoroughly after use to avoid corrosive damage that may be caused when ash gets wet. Barrel grills should not be moved once they are hot. Plan ahead to barbecue in a spot with plenty of ventilation.